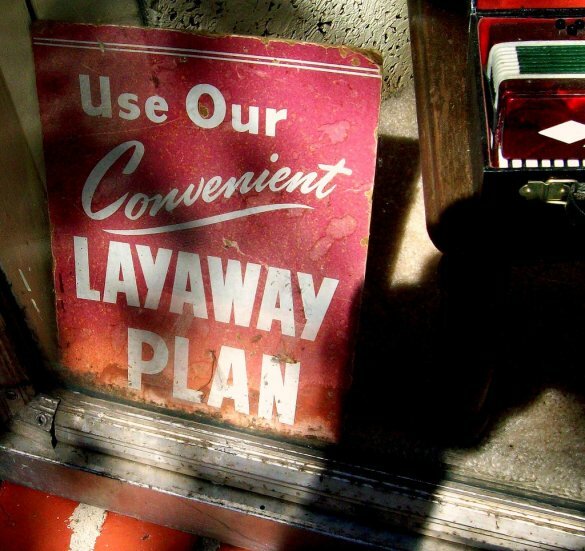 Layaway: a Formal Delayed Gratification Program? More and more layaway plans from retailers like Sears and Kmart are making a comeback largely because of the recent economic downturn and credit worries. So that begs the question is layaway a good alternative to just putting the purchase on your credit card? Let’s dig into the details of the layaway program (we’ll use Sears terms as an example) and come to a conclusion. Layaway simply put is a method to purchase an item, say an electric quesadilla maker, without paying for the entire cost. You are then put on a regular payment plan to pay for the item in it’s entirety. The important difference between this process and a credit card purchase is that you don’t get to take your quesadilla maker home with you. You get it when you make your final payment. You also avoid paying interest on the item while you are working through your payment plan. So at a high level layaway seems like it might be a good option if you want to purchase a larger item but are worried that it might not be available in the future or perhaps it’s on sale. Let’s look at the fine print. The minimum down payment is $15 or 20% whichever is greater. There is a $5 non-refundable service fee on all new layaway contracts. On top of that a $1 service fee will be charged on merchandise totalling up to $500. A $5 feel will be charged above $500 worth of merchandise. Once an item is put on layaway you have 8 weeks to pay it off in full. Biweekly payments of 25% of the original balance are required. To cancel your layaway it’s $10 on top of your $5 non-refundable service fee. And frankly that’s what they’re betting on. A lot can happen in eight weeks. If you don’t have the money to purchase the item now there’s no guarantee you will at the end of those 8 weeks and you’ll go home empty handed with your wallet $15 lighter. You have the option of one price adjustment on advertised items with the first 14 days of the layaway date. That means if after 2 weeks the price suddenly goes down you’re out of luck unless you want to cancel the layaway program take the penalties and buy the item at the sale price. Now obviously any option you use on your own is not going to help you if that item is not available at the end of your own plans term. But unless you’re just trying to get the last tickle-me Elmo for little Timmy this shouldn’t be a problem. Shocking I know, but you can just as easily take your item’s purchase price, divide it in 25% blocks and put that amount of money in your savings account every 2 weeks. Guess what at the end of 8 weeks you’ll have the money and won’t have lost various fees for the privilege. You’ll even learn a little bit of interest. Furthermore you’ll also have had plenty of time to really think through your purchase without feeling trapped by a layaway program. The Internet is teaming with deals, coupons and shopping comparison sites. Use your time to find the absolute best deal on your purchase. You might just be able to purchase your item earlier for less. You might also give yourself some time to consider whether you really need or want this item. Yes that’s it, I know this isn’t ground breaking stuff but in the heat of shopping warfare it’s easy to get caught up in the fever and layaway might seem like a terrific idea. So instead delay your gratification and think how much sweeter that quesadilla will taste. P.S. I like mine with Pepper Jack Cheese when you invite me over. I’ve never understood layaway. If you have the cash, pay cash. If you don’t have the cash, either don’t buy the item or (gasp) use a credit card. At least with the credit card, you have the potential for no fees (if you pay off the bill on time). And if you decide to return the item, you don’t incur any fees (such as the layaway cancellation fee). Just another way to work yourself into believing you can afford something you really can’t and can get you into more debt. I like homegrown method 🙂 save money yourself and buy it after waiting period to see, if you really wanted that items anyway. .-= Zengirl´s last blog ..10 Creative and Frugal hacks =-. I guess layaway is for people who don’t know how to put money away. I am bad about delaying my gratification but why pay the fees, however slight, when you can stick your cash in a piggy bank for eight weeks and buy it outright. .-= Kyle´s last blog ..Protect Your Money, Protect Yourself =-.